Here I am on the banks of the River Dee, looking across to Aberdeen. I had just left the overnight sleeper train from London, and was in Aberdeen waiting for the overnight ferry to take me to Shetland. In the River Dee, I saw dolphins. 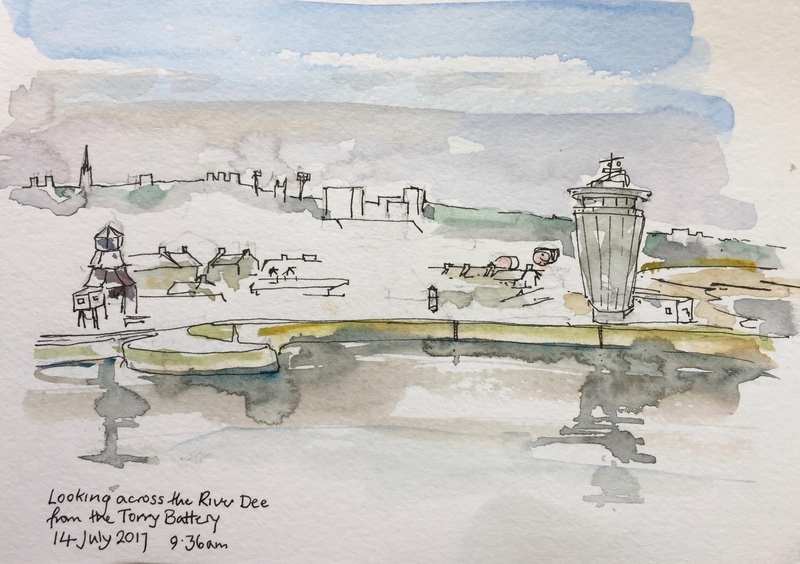 I walked to the Torry Battery, built 1858-1860. In the picture on the right is the “Aberdeen Harbour Operations Centre”. The ferry docked in Lerwick, Shetland mainland. It was raining. 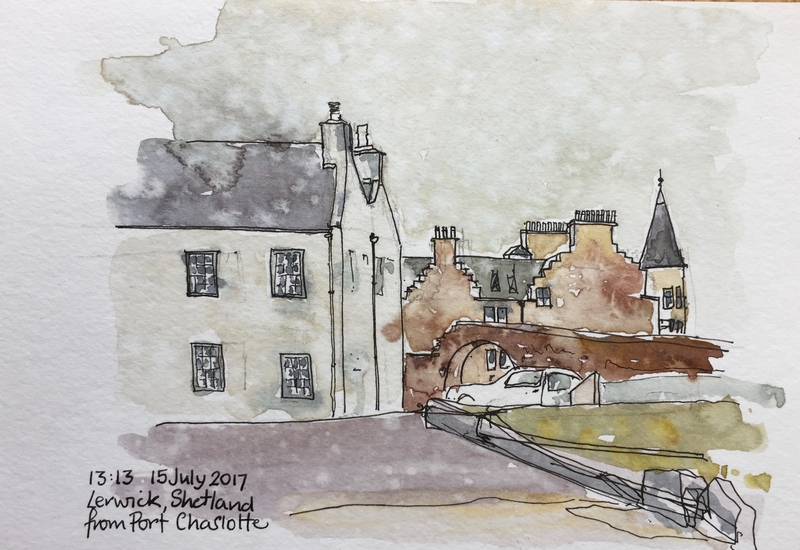 I drew this picture in Fort Charlotte, sheltering from the rain under the thick walls of a gate. The shelter was not perfect, as you see from the water splattering the picture. Bus number 9 from the Viking Bus Station took me to the West Mainland, where I was staying in Burrastow Cottage. Here is a drawing of Burrastow House. The cottage is the small building, in the background on the left. I did a lot of walking. 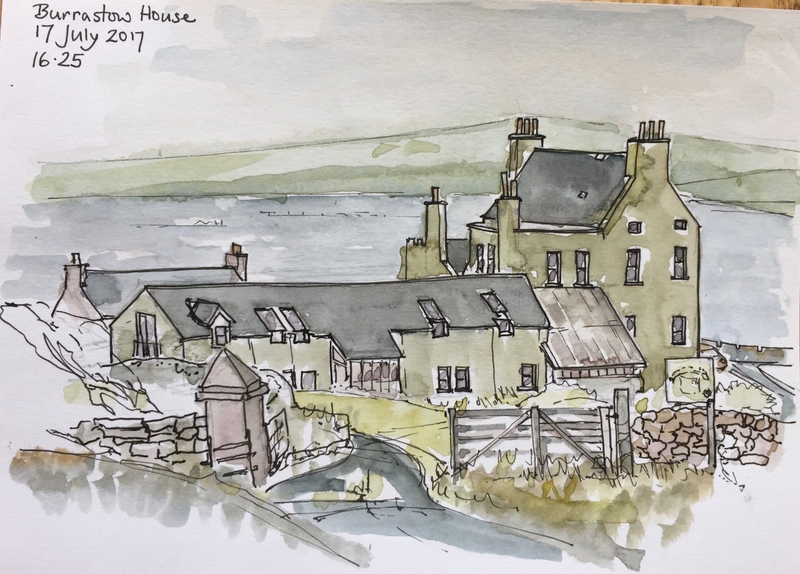 In Lerwick I bought a landscape sketchbook. So I experimented with using both pages. There’s a lot of landscape in Shetland. Above, I tried to show the bright yellow flowers, very vivid, in the low light. The picture above shows the bay and the village of Walls. 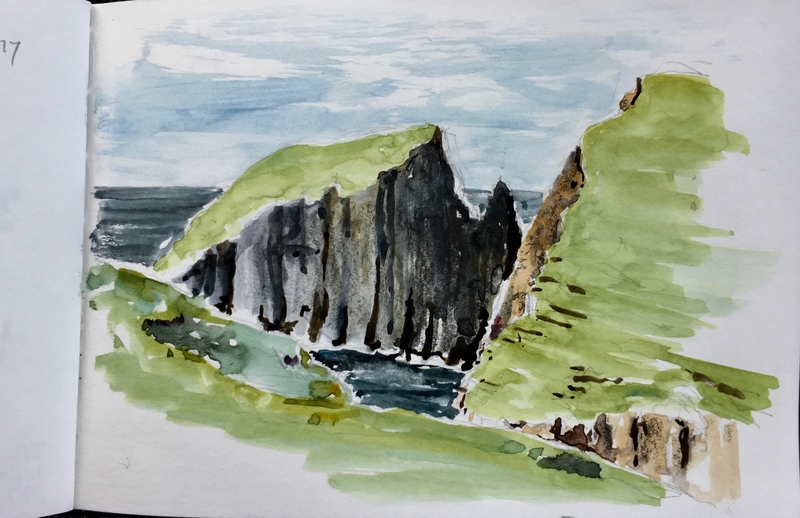 Above is an attempt to draw the huge cliffs near Burrastow. The peninsula is the delightfully named “Wards of Mucklure”. I drew the sea. Above is the view from the door of the cottage. Out there, one day, I saw an otter. 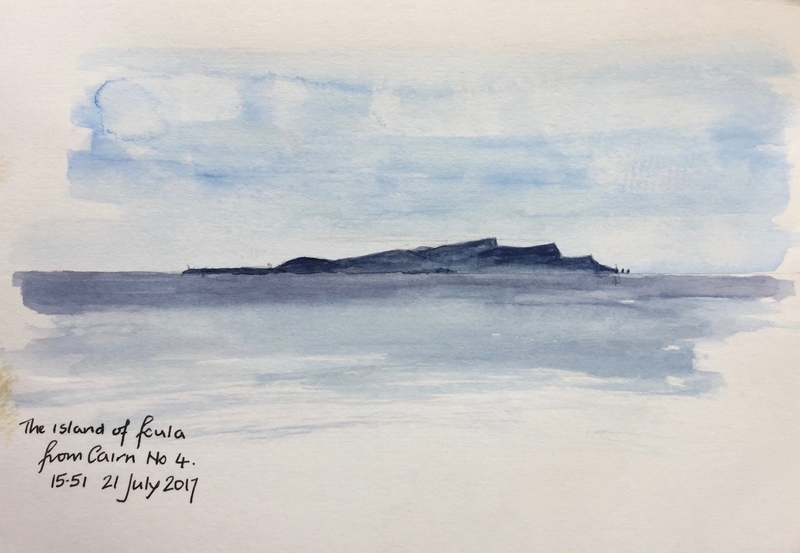 Above is what the island of Foula looks like, viewed from Cairn 4. 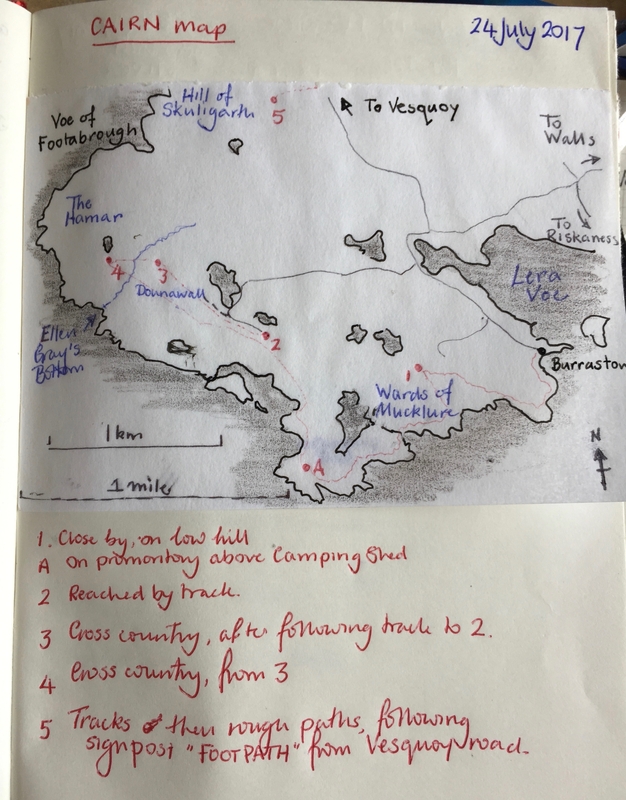 I numbered the Cairns. I also drew the plants. That picture of the drain hole shows iris plants above dark water. The picture on the right shows flowering sorrel, and iris leaves. 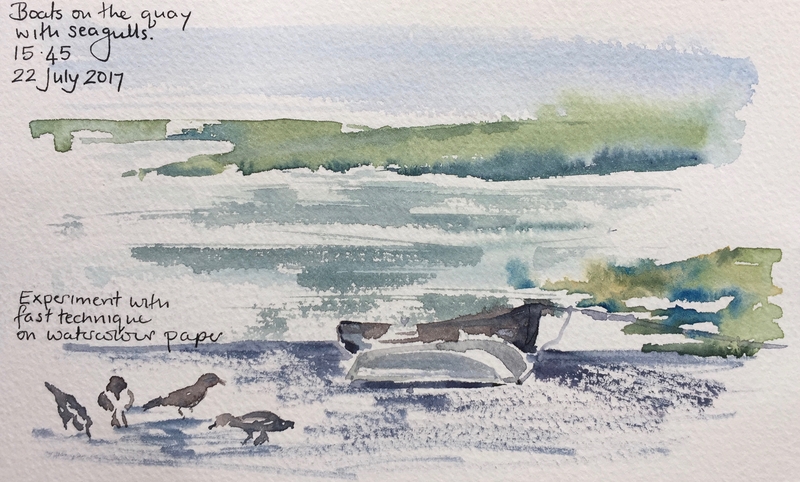 Here is another sketch of the sea. I tried drawing quickly. Sometimes it seems to work better that way. 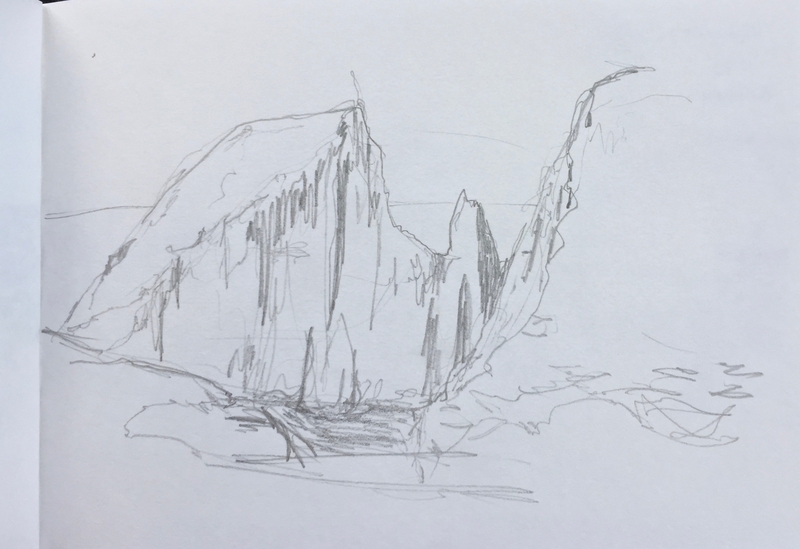 And here is a sketch on the way back to London.